Earlier today, I posted about the NEW Pantone Color of the Year! CLICK HERE to see the blog post. It sparked some interesting discussions in some of the forums I belong to. It's clear that color is really a personal thing and can create some very strong opinions! Everyone wants their favorites to win! I also feel that color, particularly color sensibilities, can be such a mutable thing. Depending on where you are, who you are, or what you're going through... what colors you're drawn to can change and be influenced. What might be appealing one moment, might not be the next... and vice versa. I know that whenever something is dubbed the "XYZ of the Year" or something like that, it often times evokes strong negative responses. "Who are they to judge?!?!?!" Well... if you're not familiar with Pantone, it's a company that has spent decades codifying, naming, studying, and categorizing colors. They work with industry professionals from all sorts of different disciplines, from the fashion industry to car paint companies. They also work closely with graphic designers, illustrators, and the media... so chances are, whether you're familiar with Pantone or not, you've seen evidence of their work. When they find the Color of the Year, they have industry professionals comb the catwalks of Fashion Week events around the world and do sort of a cross-section of what was the most prevalent. They use this as the basis to generate their report. They are exhaustive in examining colors and are very thoughtful in their decisions. It's quite the production! I appreciate how sensitive they are to current events and the zeitgeist of the moment to make their final choices. It's quite the impressive feat to suss out the color that defines a moment in time! This certainly doesn't mean that you have to "like" every Color of the Year! But I find it fascinating to look behind the scenes. It's sort of like a magic decoder ring and if you know what to look for, it's kind of fun to see how much Pantone plays a part in our daily lives. And when I find a color challenging, I think of it just like that! A challenge! I use it as a way to push myself out of my comfort zone and expand my understanding of the color. Some of the colors might not be my favorites, but working with them has taught me to appreciate them more. It's funny when I dissect why I have certain aversions or attractions to specific colors. My personal experiences have helped inform my reactions and I always find it helpful to understand why something is the way it is. In one of the groups, there was some debate about what colors have been chosen previously, so I put together a quick chart from 2000 to present. It is a lovely rainbow of colors that reflect our ever-changing times. 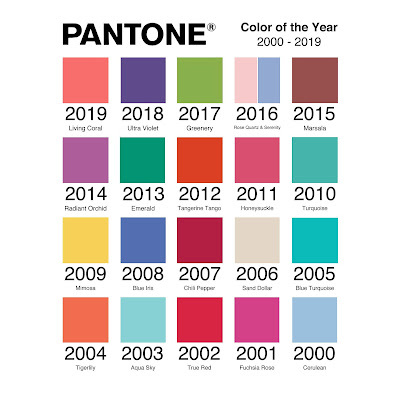 To learn more about Pantone and the previous Colors of the Year and what goes into the selection process, CLICK HERE. Earlier this year, we launched a kit that featured this shade as the main color. It's surprising how this color is both energetic, but also calming. Many of the participants of the kit had mixed feelings, saying that it was a tricky color to work with. But all of the projects were amazing! It's a color that pushes us out of our comfort zone, but also has a fond nostalgia, harkening to bygone eras. 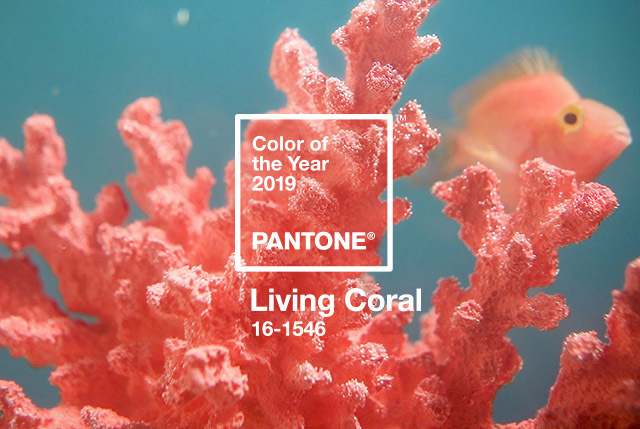 Leatrice Eiseman, the Executive Director of the Pantone Color Institute, said, "Color is an equalizing lens through which we experience our natural and digital realities and this is particularly true for Living Coral. 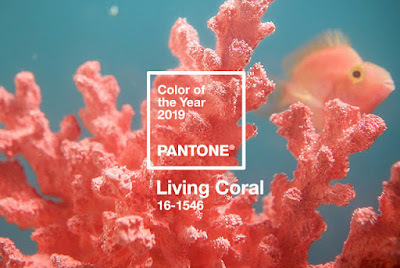 With consumers craving human international's and social connection, the humanizing and heartening qualities displayed by the convivial PANTONE Living Coral hit a responsive chord." You can read the full Color of the Year report by CLICKING HERE. I really love how thoughtful they are when they consider their selections. I started these pieces on my way to San Francisco. It was Dia de los Muertos and I kept drawing sugar skulls and making little color field studies on the plane. My fingertips were brightly colored, almost as if I had dipped my fingers in a rainbow and they came out stained. The day that we arrived, we wandered around. We were explorers without a destination. I kept seeing sugar skulls and rainbows wherever we went. They were in the grates, hung in the trees, and brightly painted on side street murals. As evening set in, we were both travel weary, high on friendship, and slightly tipsy on margaritas. We decided to make our way to the altars set up at Garfield Park. As we got closer, it became more surreal and dream-like. Crowds of people dressed up in costumes with painted faces surrounded us. They were holding candles and photographs, and the smell of incense and marigolds got stronger. We were swept up with the strangers, the mourners and the onlookers alike. 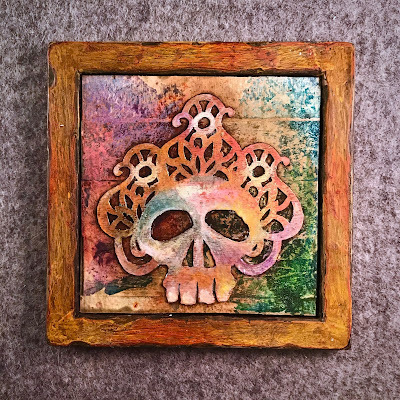 Andrew Thornton, "San Francisco Sugar Skull 1". Mixed media, 2018. 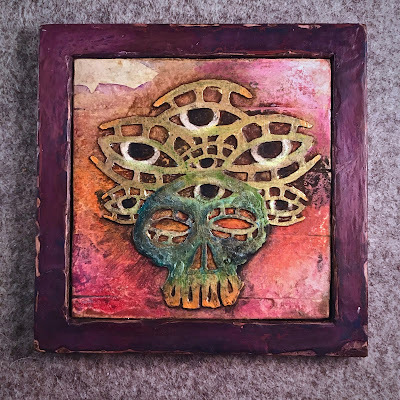 Andrew Thornton, "San Francisco Sugar Skull 2". Mixed media, 2018. Each day I was there, I tried to go on a little walk. Sometimes I went with my sister. Sometimes I went with my friend, Jess. But more often than not, I was on my own. I went when they were at yoga or running errands. I marveled at the flowers and the murals and the urban heartbeat. Lovers holding hands, people of every color and creed. Everything seemed like a celebration. At first. But the more I walked, the more I could sense a deep sadness. Stacks of rocks, a circle of names, memorials tucked beneath trees. Fly with angels. In loving memory. R.I.P. 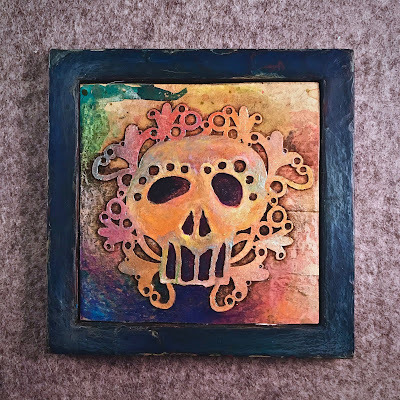 Andrew Thornton, "San Francisco Sugar Skull 3". Mixed media, 2018. This city had a memory. Andrew Thornton, "San Francisco Sugar Skull 4". Mixed media, 2018. And the memories were of bright, shiny, vibrant people, struck down by an epidemic. We had come to this city when the veil between worlds was thin and the echoes of the spirits of the rainbow could be heard. They could be felt. Andrew Thornton, "San Francisco Sugar Skull 5". Mixed media, 2018. 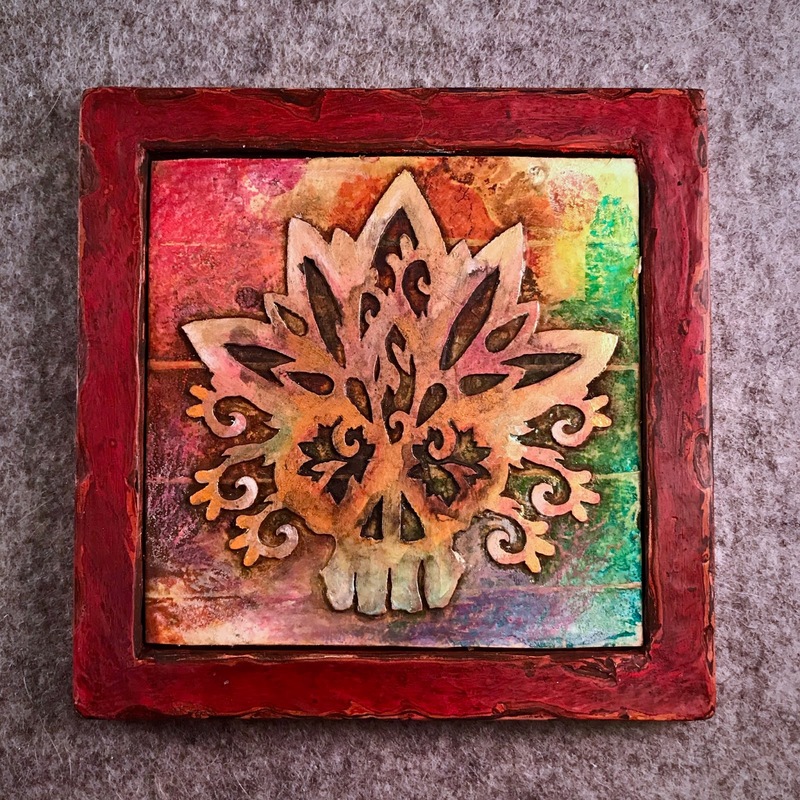 Andrew Thornton, "San Francisco Sugar Skull 6". Mixed media, 2018. I started these pieces on my way to San Francisco. I didn't know what they'd be, but as I worked on them a little each day, they started to take shape and find form. The mixed media collages are made up of layers of cut paper, paint, pigments, ink, and colored pencil. Many of the first several layers cannot be seen at all or only faintly so, as they were whited out or painted over. I wanted to give these pieces history and like most histories, not everything is revealed, but still remains and is ever present. 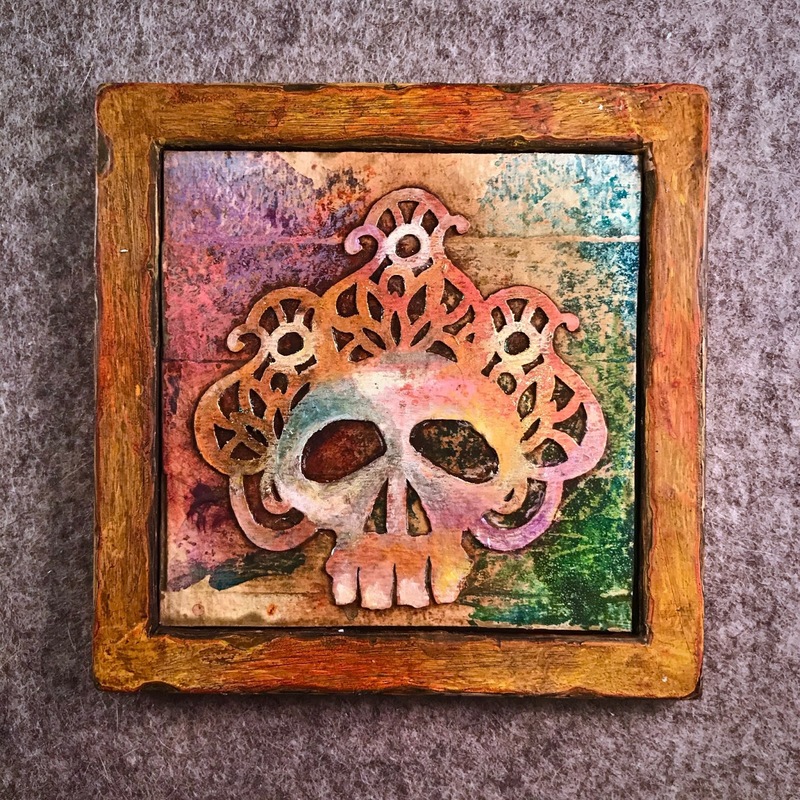 The pieces are embellished with touches of iridescent and metallic pigments and paints, and even a little glitter. 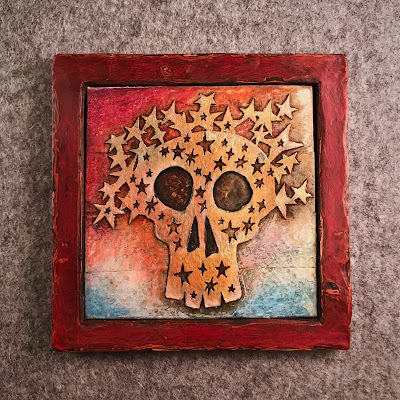 Andrew Thornton, "San Francisco Sugar Skull 7". Mixed media, 2018. 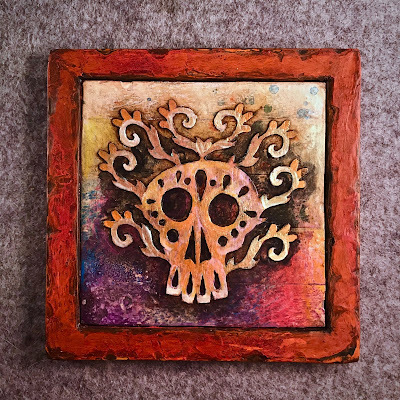 Andrew Thornton, "San Francisco Sugar Skull 8". Mixed media, 2018. Once I finished the collages, I knew I wanted to give them a sense of veneration and completion. So I set about framing them, but I couldn't find any commercially available frames that conveyed that same sense of history in the collages. So, I made the frames. The frames are made by layering dozens of coats of paint that are then sanded and buffed. It takes hours to achieve this finish, but I think it's worth it and fits with the spirit of the collages. 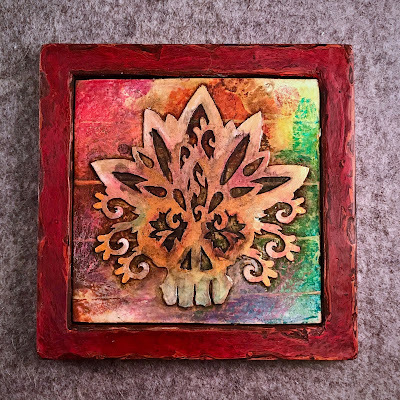 Andrew Thornton, "San Francisco Sugar Skull 9". Mixed media, 2018. 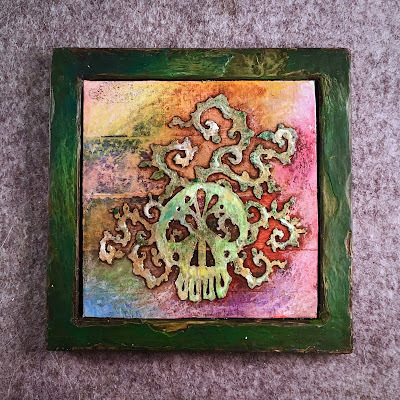 Andrew Thornton, "San Francisco Sugar Skull 10". Mixed media, 2018. 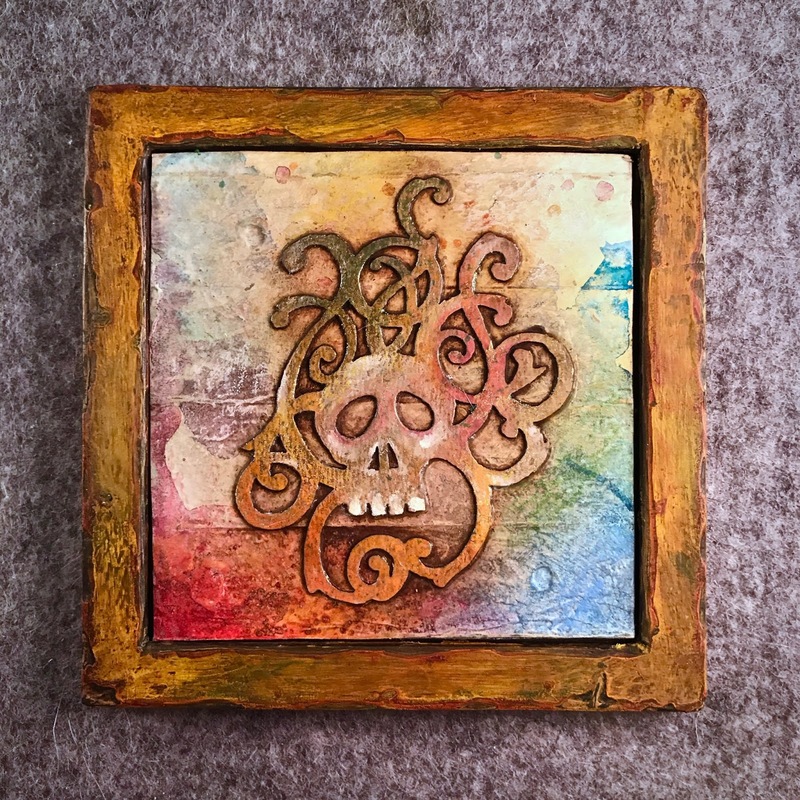 Each piece measures 5"X5", framed. 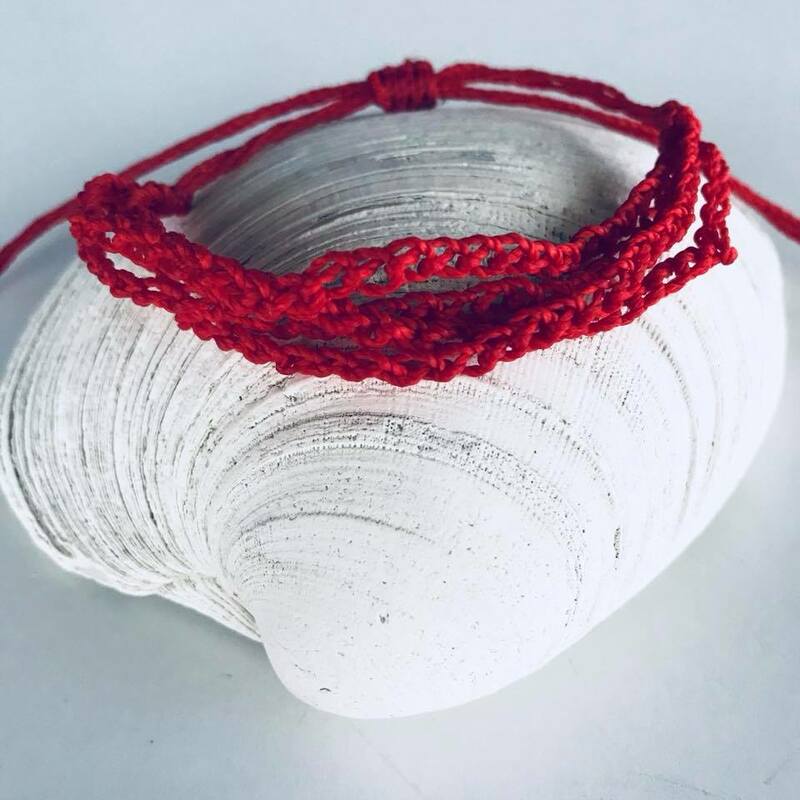 I am selling them for $75 each plus shipping with a portion of the proceeds to go to the San Francisco AIDS Foundation in recognition of World AIDS Day on December 1st. The San Francisco AIDS Foundation has a mission, "to end the HIV epidemic in the city where it began, and eventually everywhere. Established in 1982, our mission is the radical reduction of new infections in San Francisco because we refuse to accept HIV as inevitable. Through education, advocacy and direct services for prevention and care, we are confronting HIV in communities most vulnerable to the disease." If you're interested in claiming one or more of the pieces, email me and if it is still available, we'll arrange payment options. 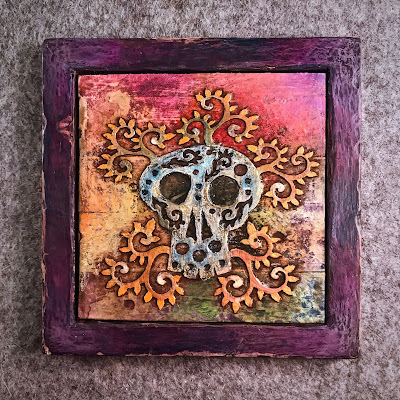 Andrew Thornton, "San Francisco Sugar Skull 11". Mixed media, 2018. 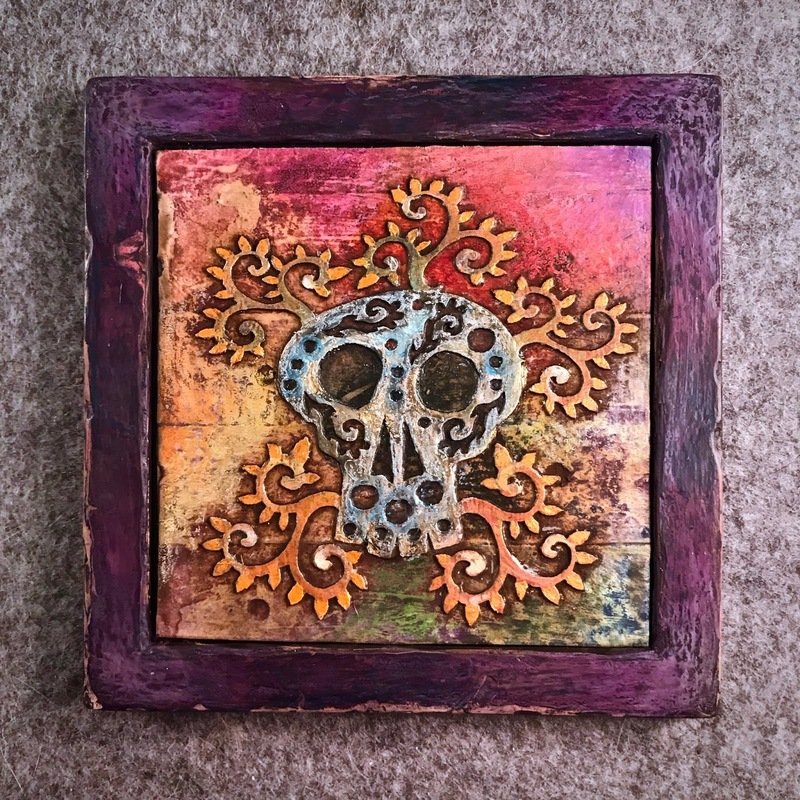 Andrew Thornton, "San Francisco Sugar Skull 12". Mixed media, 2018. For the Inspired by Reading Book Club at Allegory Gallery we read “Dark Matter” by Blake Crouch. We all really enjoyed it and agreed that it was a fast-paced adventure that makes you wonder what your life would be like had you made different decisions. This is what I made inspired by the novel! Whenever they “travel” in the book, the characters have to go into a cube that becomes a tesseract. 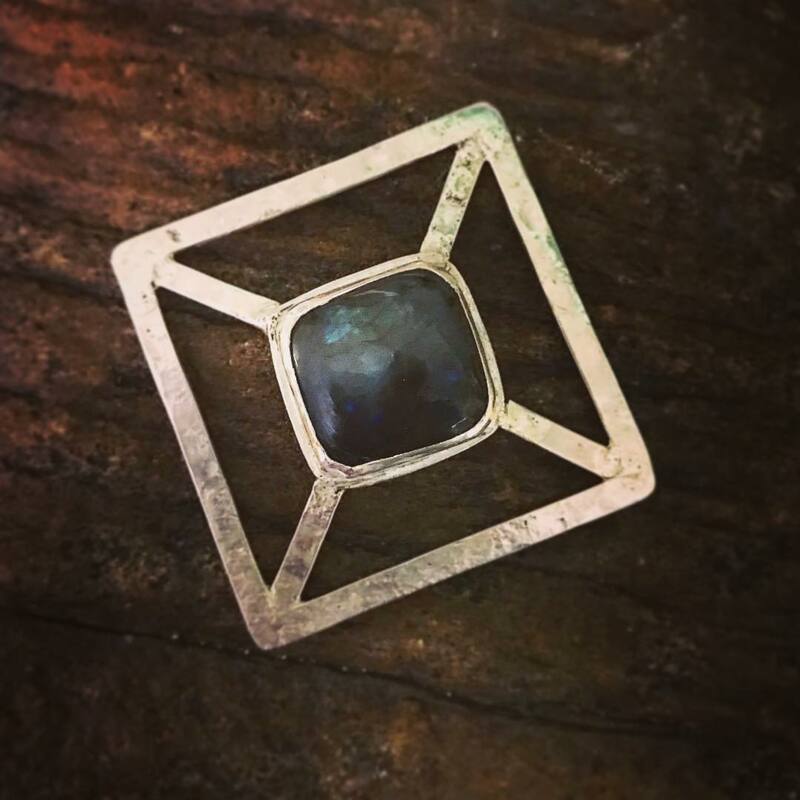 I decided to fabricate a pendant out of sterling silver and bezel-set a labradorite in the middle. I had this idea that I’d make one that was more three-dimensional, but it turns out constructing very precise, geometric, intricate, architectural pieces is not my calling! Instead, I made a simpler version. It was still not as easy as I thought it’d be, but far more simple than the cube within a cube that I thought I’d make at first. Even so, I could imagine a citizen of the futuristic city of glass and steel wearing this. I sawed out a square and stamped the words “new worlds” on the back, because each choice creates a new one. During the reveal, I posted the piece online and tagged the author. I never really expected anything, because you know authors are busy writing books and stuff. About an hour later, Blake Crouch replied and said that my work was beautiful! I know that he's just a regular person and all that, but I totally had a fangirl moment. It's really amazing when someone who created something that moved you and inspired you to make something interacts with you. I just adore Christi Friesen! Not only does she have a good heart and a wonderful sense of humor, but Christi is a talented artist who is always playing, experimenting, and trying new techniques. What I appreciate about her practice the most is that she doesn't take herself too seriously. Don't get me wrong! She's a dedicated craftsperson and has an extensive career as a teacher, author, and internationally exhibited artist, but she's not afraid of whimsy and having fun. This sense of child-like glee and mischief makes her work sing! Christi is most known for her work with polymer clay and she doesn't disappoint! The book has a load of different polymer clay ideas. She also has useful information about epoxy clay, resin, and other mixed media techniques, including dozens of different surface treatments! CLICK HERE to check out Christi's new book and get an autographed copy for yourself! She always has tons of workshops and events planned! CLICK HERE to see some of the great things she has in the works. 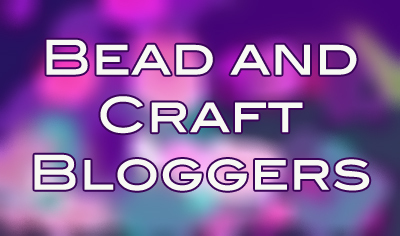 I'm always curious to see what the Bead and Craft Bloggers will come up with next! There's always so much creativity on display. In this post, we're reminded of the importance of knowing your body and staying proactive about your health. Terry Jeanette shares her experiences with PE and DVT. It's that time of year again! 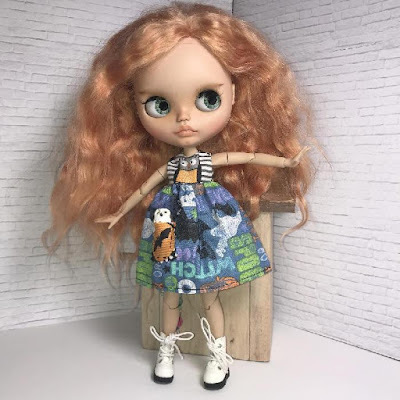 Tammy embraces her spooky side and sews Halloween-inspired dresses for her Blythe doll collection. 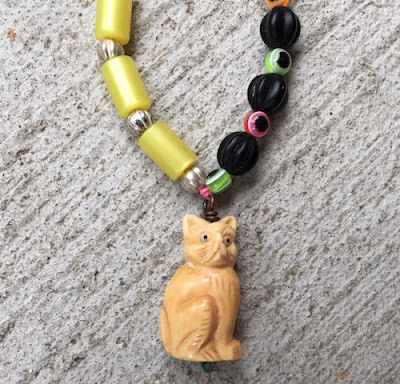 Ann breaks out some of her brightly colored beads to create a whimsical feline necklace. 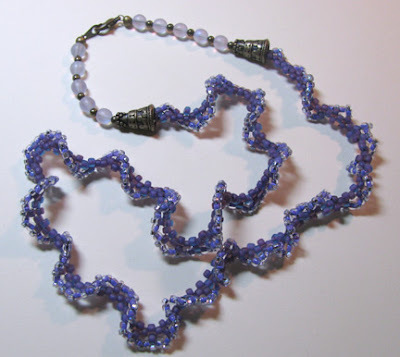 Cyndi celebrates the end of summer with her last beaded rope necklace of the season – a ruffled beauty in shades of purple peyote stitch. Even with a major overseas trip, Sarajo shares her creations for the August Art Elements Blog theme: SWIRLS! Allegory Gallery Interviews launches their second podcast! 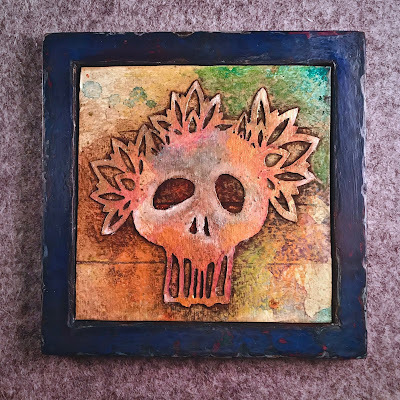 This time William talks with Michigan-based ceramic artist, Diane Hawkey. As a bonus, William and Andrew talk about how they met Diane. 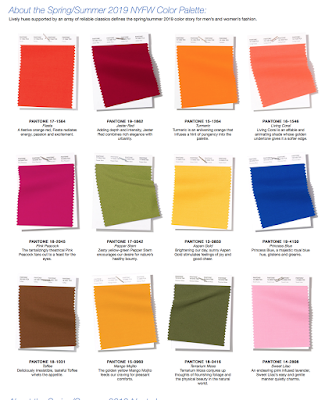 Pantone just announced their 2019 Spring/Summer Color Report. Check out what they think will be the hottest upcoming colors! They usually pick the Color of the Year from this selection. 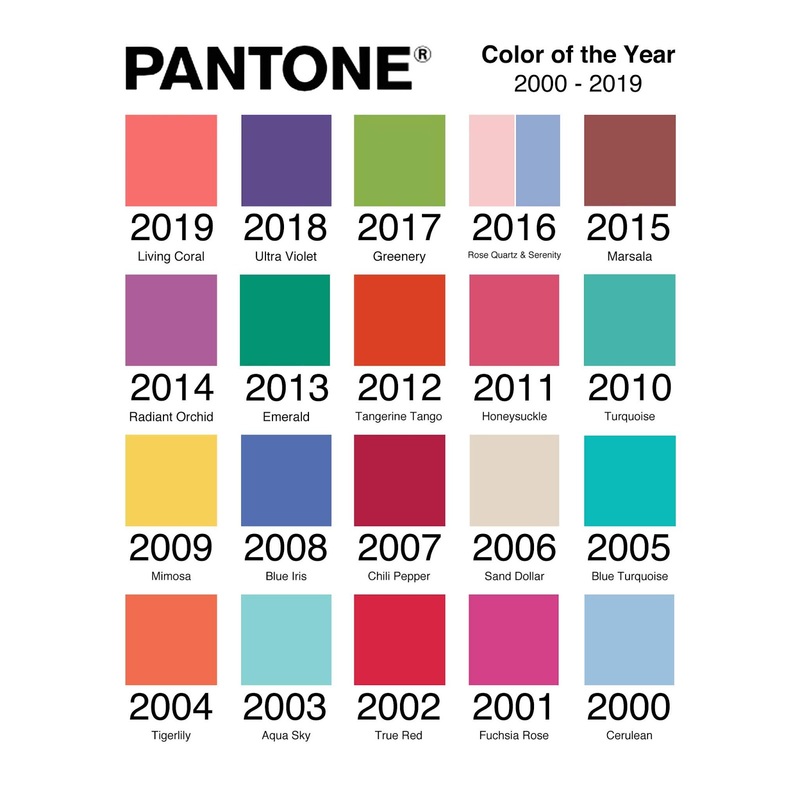 What do you think will be the Color of the Year for 2019? I remember a conversation that I had when I first moved to New York. I was talking to a friend about a mutual acquaintance who had just received their first solo show. I'm ashamed to say that what I said was unkind. Instead of being happy for them and their good luck and hard work, I was resentful and jealous. Bile fills my mouth when I think about it. And... I still think about it. Even years later, I remember how I let my higher self down and allowed my lesser self revel in meanness. While I regret that conversation, I am thankful for what it taught me. When you're negative and allow poison to cloud your mind, it festers and grows. I could have had a wonderful friendship and a relationship built on mutual respect, but instead I gave into bitterness and spitefulness. 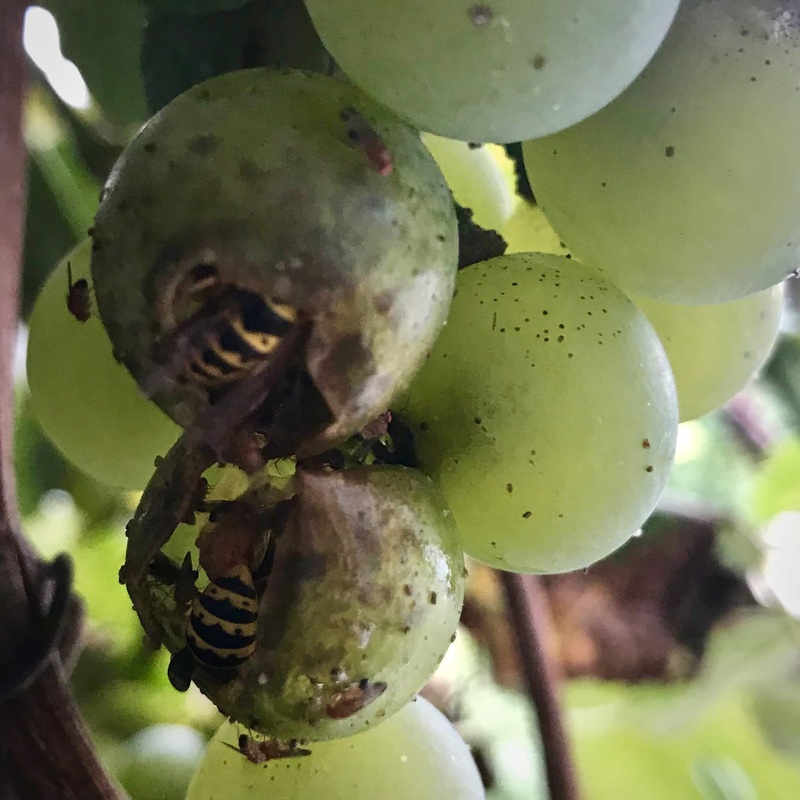 What could have been sweet had been soured. Years later, I tracked down the person that I had talked badly about and apologized to them for what I had said. The person said that it was so long ago and that they didn't remember it and that bygones were bygones. It's a testament to how forgiving and kind they were. Sometimes when I feel that meanness squirm in my stomach, I remember that conversation. Instead, I try to focus on being happy for others and their successes. When I feel sad or angry or frustrated, I try to fill my heart with gratitude and pride. Eventually there isn't enough room for all the bad stuff. It gets pushed out by all the good. I'm not perfect and am far from enlightened. I know that I'll never be free from those negative feelings... they'll always be around, but it's up to me to determine how much I give those feelings permission to impact my life. It's up to me to decide whether I empower the positive or the negative... and deal with the consequences of my thoughts and actions. Swarovski is a huge player in the jewelry industry and as such, they expend considerable resources to develop trend studies each year. These are used to create new products, offer suggestions and applications of current items, and touch on current influences. 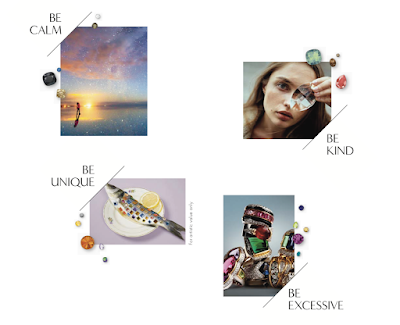 For 2019, they've boiled down the Jewelry Trend Study into four categories: be calm, be kind, be unique, and be excessive. Those four groups are then broken down further into different descriptors. Regardless of whether or not this is useful to you and your practices, it's fascinating to see what they feel is important and influential. CLICK HERE to read the full report. I was going back through some old blog posts and I realized just how important this place that really isn't a place used to be to me. 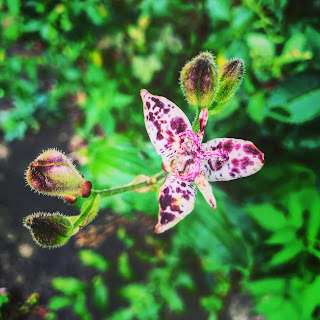 When I was struggling to find my voice, dealing with illness, or searching for long lost family members... this blog was here for me. I wrote my heart out and wore it on my sleeve. It isn't the same anymore. I guess nothing ever really is. We're always changing and in this world that moves all too quickly, why would it be any different? I tried to think of a moment where it all started to change, but I couldn't really remember a single moment. I think it was gradual, where the words dried up and I felt thinly spread. I felt all talked out. Over 12 years of posting, I suppose it wasn't a surprise. With all the other platforms and only so many hours in the day, it was only natural that the steam would eventually start to wane. 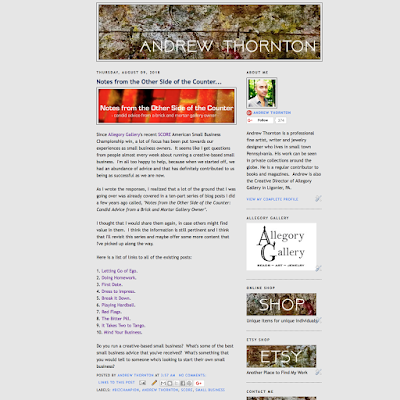 Over the past few weeks, I've attempted to blog more regularly and it has certainly been a challenge. Even so, I still want to capture the magic that was once there, to shake it up and make it live again. I don't know if it's possible. Or if I'm just grasping at straws and being nostalgic, but it doesn't feel over yet. It especially doesn't feel done when I read back over some of the things I've written over the years and they still feel like something. They don't feel dead and cold yet. So, I guess I'll keep trying. My birthday is just around the corner and it seems like it's always a catalyst for deeper reflection. I get more pensive this time of year. With the shifting of the weather and the changing of the season, I think back over the past year. As the crisp autumn air enters my lungs and the chill creeps up my limbs, memories and emotions start to crystalize and form a picture. I try to take a few moments to examine the image, learning from what has come before. The past year has been a tumble of emotions, a swirl of triumphs and sorrows. I've felt so fragmented, as if to carry on through the highs and lows, I've had to compartmentalize and embrace the individual facets more. I have to admit that I was struggling with this. How can you be happy and sad at the same time? How can you be excited and fearful all at once? How do all the pieces and parts fit together to form a whole? Most days I vacillate between an iron will to push forward and get things done and being immobilized by this sense of being lost and weeping not only for myself, but the world. I know that my tears aren't an elixir to cure the hurts of the world and that there is little accomplished by feeling the way I do, but I can't help it. It's like the more that I try to be productive and proactive, the more the other feelings grow. One cannot eclipse the other. They're locked in a battle of escalating emotions. Do you remember a game of plucking petals from a flower alternating between, "he loves me" and "he loves me not"? As I was contemplating the past year, this image popped into my head. At first I dismissed it. Why was THAT relevant? But I kept coming back to it. And then it hit me. Life is like a flower. A flower is made up of petals. 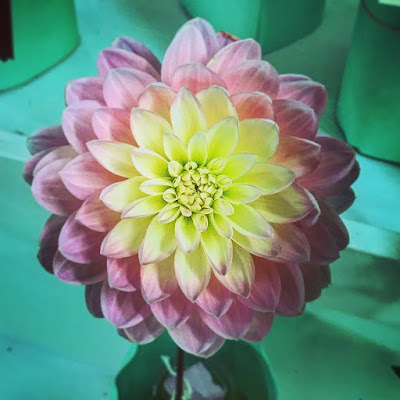 Even though the petals feel wholly individual, they are all connected and form a single object. When we look at a flower, do we see each petal or do we see the collective whole? I think I've been looking a little too closely and need to step back to really appreciate the whole picture. While certainly there has been sadness or hardship, there has also been moments of joy, happiness, and peace. And perhaps because of the former, the latter is made all the more beautiful. Life is bittersweet and full of texture. It is made up of highs and lows and can be appreciated more fully when considered together. The fragments form a mosaic, a picture that can only be seen from a distance. Being myopic can be useful, but it's just one way of seeing. It's here! That's right! 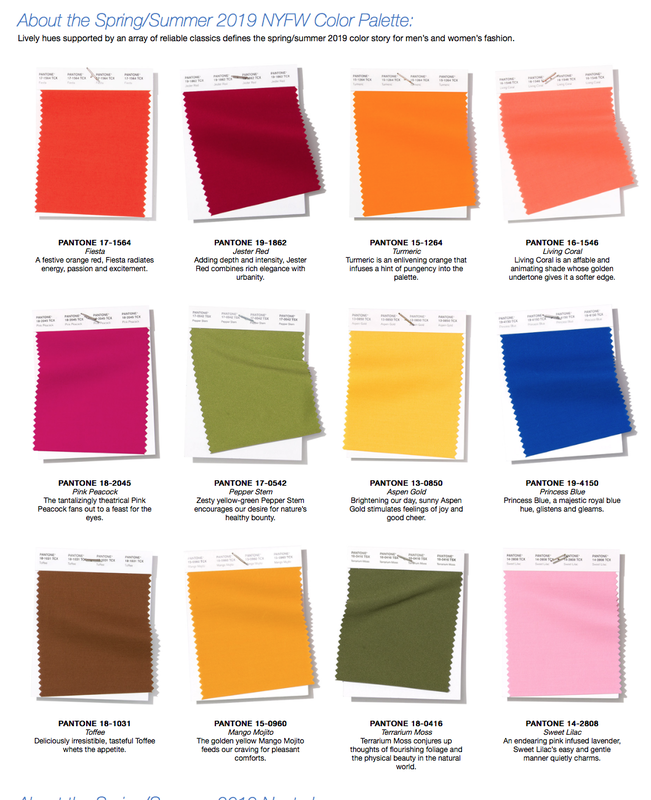 Pantone has just announced their latest NY Fashion Week Spring/Summer 2019 Trend forecast. You'll be seeing these colors a lot in the upcoming year. This report is all about vibrance and strength! It's about combating challenges and facing the future full on. Usually the Color of the Year is picked from this line-up. What's your guess as the future 2019 Color of the Year? Last year they started a special palette of neutrals. While this might see not quite as much fun as the regular report, they're actually a wonderful foundation to build color stories. You can read the full color report by CLICKING HERE. I'm always in awe of all the creativity that's on displayed in the different blog posts. It's always inspiring and encouraging to see what others are making. 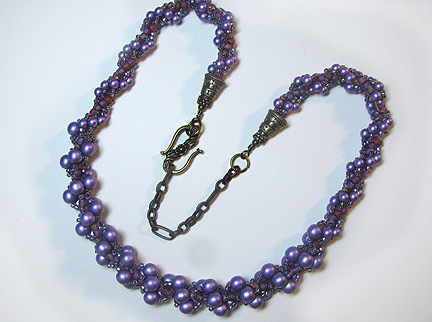 Cyndi shows how to make a stunning spiral rope necklace with opulent purple pearls. 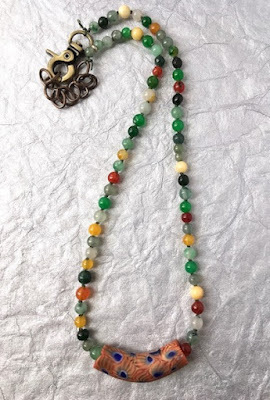 Ann creates a lovely new necklace using beads from Darn Good Yarn and an old African bead from her collection. The seasons are changing and autumn inspiration has struck Terry Jeanette! Her new line of jewelry incorporates a beachy vibe with a fall color palette. Sarajo creates an assortment of pod related jewelry for the July Art Elements monthly challenge, as well as shares some of the headpins from the Adornments Retreat. Sarajo also made a mold for future pod components. 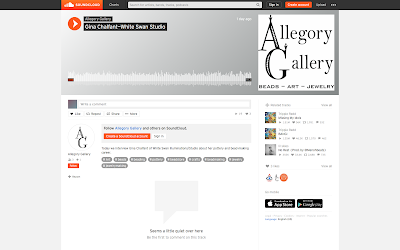 Allegory Gallery launches their NEW series of podcasts called, Allegory Gallery Interviews. In the first interview, William sits down with ceramic artist, Gina Chalfant of White Swan Illuminations. Drawing on my experiences from being both an artist and a gallery owner, I share some of my small business guidance gleaned over the years. These Czech glass sugar skull beads have been hanging around the studio for a few years now. They were in a little ceramic dish next to my computer, peering up at me with their floral eyes. I just love them! I think they're fun and festive. 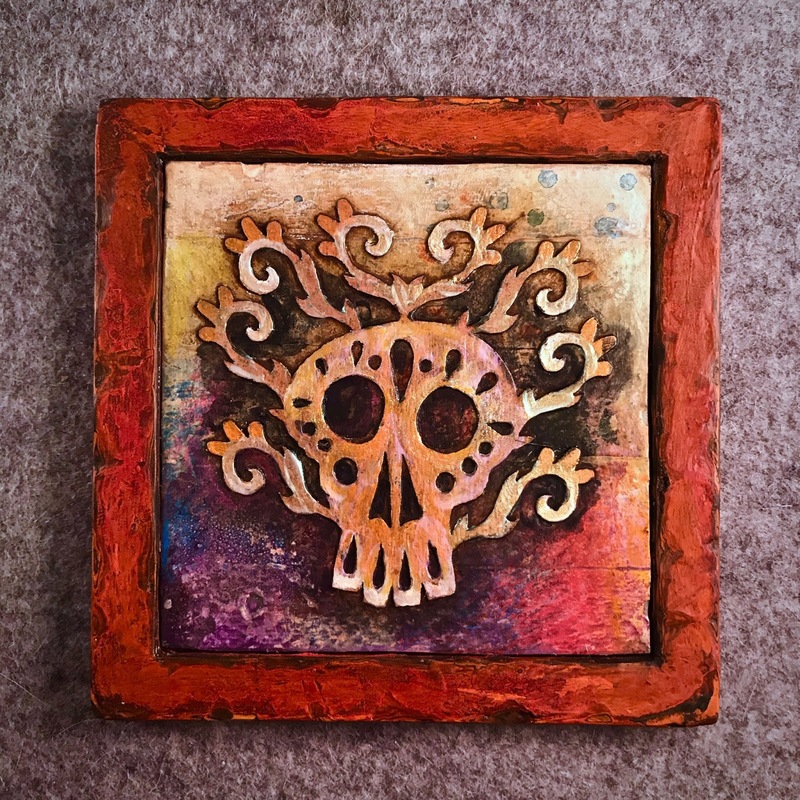 When you look up the Day of the Dead (Día de Muertos), it's so bright and colorful! It really is a celebration of remembrance. I knew that I wanted to do something special with them, but I didn't know just what I wanted to do with them yet. That's when I had the idea to bezel-set them! I've been bezel-setting a lot of stones lately and bezeling has a really nice way of finishing something off and framing the piece. I think this technique dresses the components up, without taking too much away from them. So... it took me awhile, but I finally set the beads in sterling silver, soldered on a bail, and made them into pendants. Surprisingly (or maybe not so surprisingly), it took longer than I thought it would. Apparently filing all the curved areas and sanding out the scuff marks takes awhile and can be fiddly work that's hard on the hands. Luckily I finished and am quite pleased with how they turned out! I know that skulls aren't for everyone! There are a lot of people who look at skulls and think they are scary or conjure up images of unruly bikers and pirates plundering the open seas. Skulls are a reminder of death and for a lot of people, that can be off-putting. For me though, I think about the saying, "memento mori". Translated from Latin, it means, "remember death". It sounds ominous, but it's a reminder that death is just another part of the cycle of life. For all things that begin and are new, so too do things end. "Memento mori" is a call for us to live good lives and celebrate the gift we have while we have it. This pendant included stamped and sawn out sterling silver that has been soldered to textured copper that I flame-polished. I really enjoy the graphic difference between the cool silver and the warmer hues of the copper. Of course, I antiqued everything, so the nooks and crannies really became the stars of the show. The darkness really brings out the details and makes them stand out... sort of like life. Even though I've been making jewelry for many years now, my jeweler's saw has been sorely neglected. That is until recently. I've been having fun cutting things out and soldering them. It's something that I've thought about for a long time, but just needed to work up to to really get going. 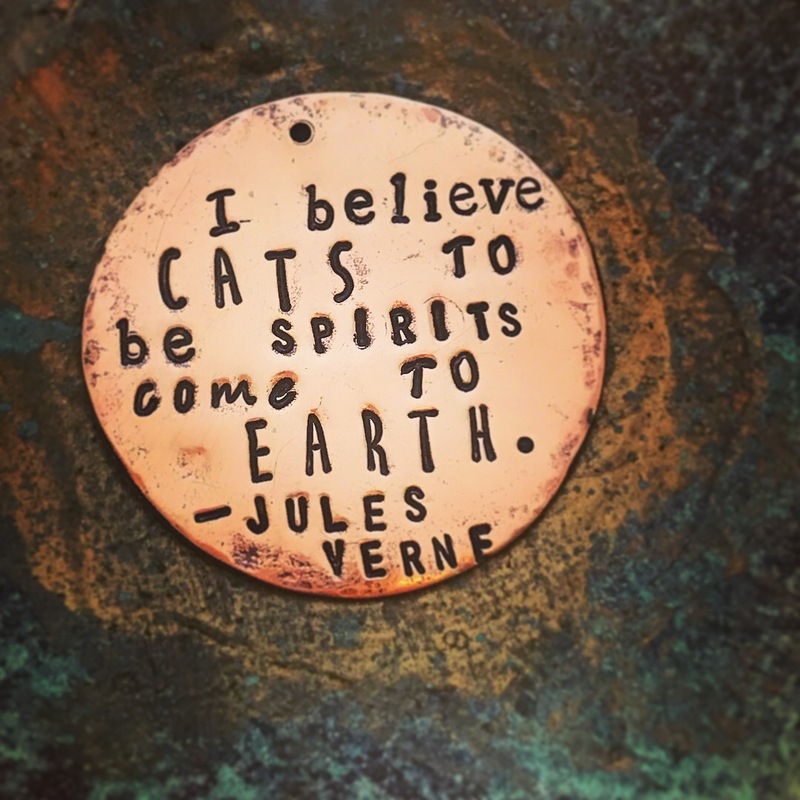 This pendant captures my love of cats! In hindsight, I realize that it sort of looks more wolfish and canine than feline, but I was working off a sketch of my cat, Barnaby, and he has a longer snout and bigger nose than a lot of cats. Therefore, when translated to cut-out metal, it has a more dog look than cat, but I can still see it. This is probably one of the most ambitious mixed metal pieces that I've made. Up until now I've really just focused on sterling silver and integrating copper. 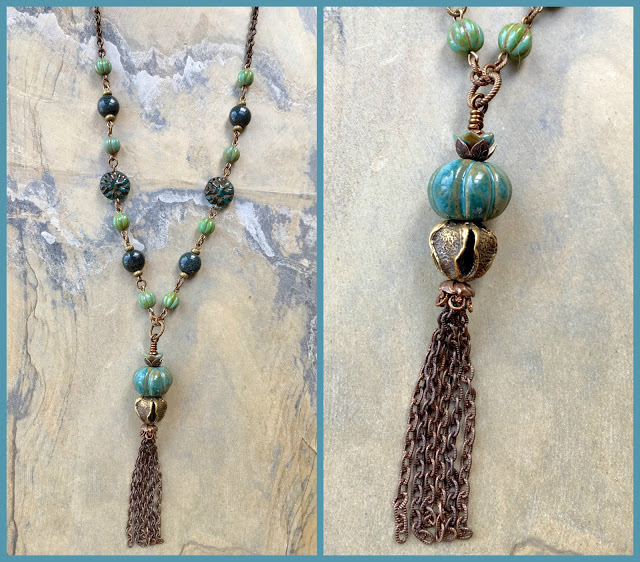 This piece has sterling silver, copper, AND bronze. I definitely had to think about how to construct the piece so that all the pieces adhered properly. Sometimes if you're not careful and you layer the pieces out of order, as you're heating up the solder for one element, it can melt other pieces or cause them to move. This is particularly challenging with tiny pieces that seem to have a mind of their own and migrate. On the back of the piece, I stamped part of a Jules Verne quote. It reads, "I believe cats to be spirits come to earth." The full quote goes on to say, "A cat, I am sure, could walk on a cloud without coming through." I like this sentiment. I think about this book called "Angel Cats" and how my cats have seemed to know just what I'm thinking and provided comfort in the hardest of hours. I've talked a little bit about symbolism before and even mentioned some gem lore, but I haven't dived too deep into the topic. Mainly because it's such a vast field. Gem lore stretches back millennia and even though there are some crossovers, there's a thousand different things a stone can mean and sometimes it can be confusing or daunting. One of the things that I like to do is to hold the stone in my hand and be mindful of what pops into my head. Is it a memory? Is it a sensation? How does it make me feel when I look at it? Are there any histories that come to mind? More often than not, these intuited meanings are usually remarkably close to what the consensus offers. Of course, even if a group of experts agree on a particular meaning, it really just depends on what it means to YOU! For instance, if you are in an abusive relationship and your partner hits you with a turquoise ring on – that experience might taint your particular feelings toward something. We're all different and unique and our experiences shape how we see and interact with the world. With these pendants, I wanted to find the most common meanings of the stones that I bezel-set and stamp them onto the pendants. For larimar, I stamped "healing". For rainbow moonstone, I added the word, "dream". Turquoise is thought to be a stone of protection, so I hammered the word "protect" and some protective Runes. Crazy lace agate has such a fun pattern and it's no wonder why it is often considered the stone of happiness. 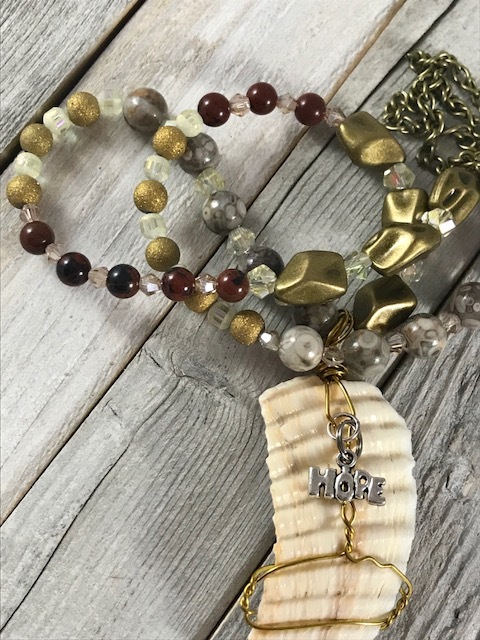 That's why I stamped the word, "happiness" on the crazy lace agate pendant. 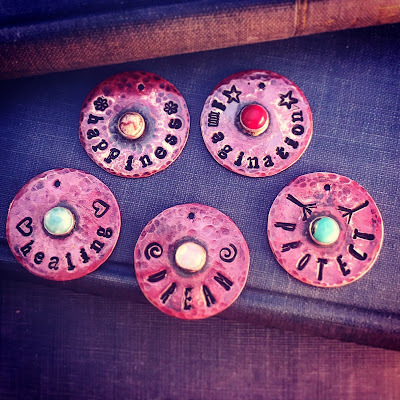 For the pendants with the coral on it, I used the word, "imagination". I think they're fun and even if you aren't familiar with so much gem lore, you'd still be able to guess what they meant. The bezel-set stones are soldered onto hammered copper bases that are flame-polished. I like the nice contrast of the cool silver and warm reddish brown of the copper. I think it really makes the stone POP and not in a bad way. One of the things that I find infinitely fascinating is what things represent. It seems like everything has a hidden story and a secret meaning. One of my metaphysical friends once told me that all things contain a signature – a fingerprint of God and that those hallmarks of individuality all meant something. They were a secret language. Later, in art school, we tried to decipher the code. When you're working primarily in a visual medium, why not learn what makes things more appealing or off-putting? Why not learn how to hone the silent communication of an object or image? One of the things that you discover when you try to break things down is that it's a little bit tricker than one might think. Depending on the culture and the time period, symbols develop and change representation. What might be a symbol of life and new beginning in one culture might be a sign of death and finality in another, like the color white. Even though there can be differences, surprisingly, several images have universal understandings that cross borders and customs and stretch across the ages. Sometimes those "signatures" are so redolent of their intended representation that it can be felt and intuited. When I'm making representational work (even when I'm working more abstractly), I always like to think about what a particular symbol means to me. What makes it unique to my cosmology? How is it different from others? And how is it the same? Despite how crazy it made our mother, we used to draw on ourselves. I remember once we made a game of drawing eyes on our hands and chasing each other around the house. Later I discovered that this was not unique to us. In fact, it has a long tradition and history. 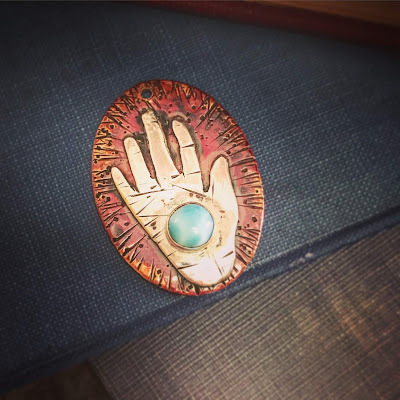 Sometimes called a "hamsa" and sometimes "the Hand of Fatima", it is a symbol of protection and is used to ward away the "Evil Eye" or bad intentions. To me, the hand is a symbol of possibility and potential. As an artist, I use my hands to make things. The eye is a symbol of the spirit and seeing what is there and beyond that. Combined, I think of how an artist works from head to heart to hand. An idea is pulled from thoughts and feelings and distilled through the artist, moving down through the heart, concentrated there, and made manifest through the hands. The act of creation is a powerful magic. What's more magical than making something from what seems like nothing? Along these lines, I think of hands as symbols of healing. I'm often reminded of the saying of the "laying of the hands". Healers use their touch as a conduct of prayer or energy or whatever you want to call it. Who hasn't been given a small bit of comfort when you're upset and someone has hugged you or patted your arm? But the hand motif has other meanings. A raised hand is a call for recognition. An extended palm is a signal to stop or yield. A handprint is also evidence, a record of being there. I think it's important to be mindful of the different interpretations, but not to let that hold you back. Instead, focus on what's important to you and what it means to you. As you're woking on something, set your mind towards your intention and your meaning, imbuing the object with that particular energy. 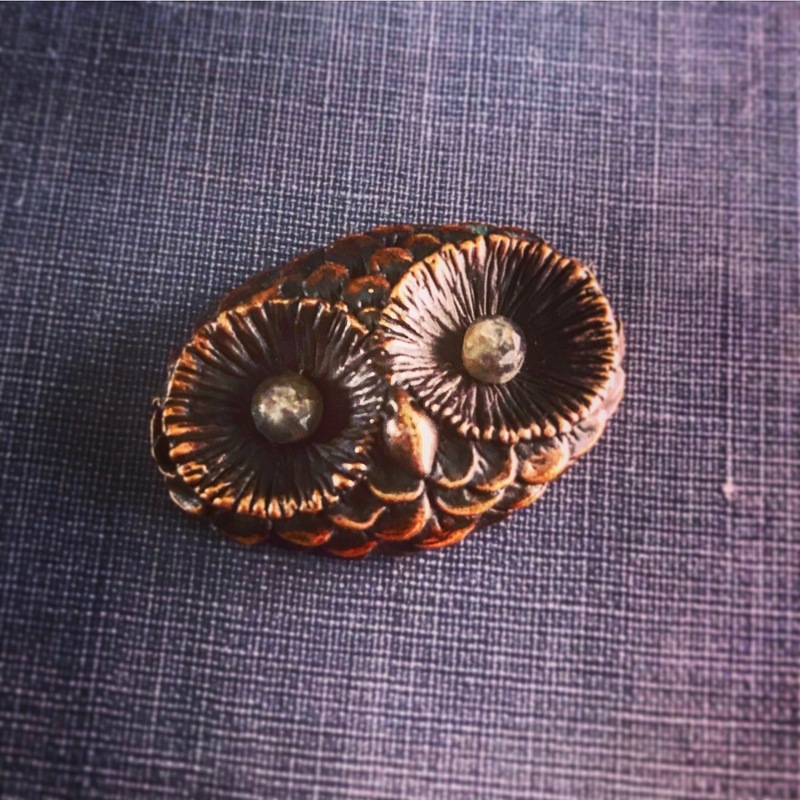 This piece was made from flame-polished copper and sawn out sterling silver. I bezel-set a tiny larimar cabochon in the palm. One could see the hand holding this "ball" of energy or as an eye. Larimar is commonly thought to represent healing, peace, love, and enlightenment. It's a stone born of fire and water, balanced between the elements. Like painting, each element adds another layer, increasing the depth and width of meaning and symbolism. When I was a kid, we used to go to the flea market "fairly frequently" and by "fairly frequently", I mean, almost every single weekend. When you don't have a lot of money, it's one of those places where that doesn't matter as much. A dollar can be stretched amazingly far and if you're lucky, there's treasure to be found! It's at a flea market that we first discovered runes. Tucked in a crumbling cardboard box, we found an almost complete set in a faded rust-colored suede bag and a tatty guidebook that was about to fall apart. The missing piece didn't phase us one bit. We were crafty even back then that made a polymer clay replacement. 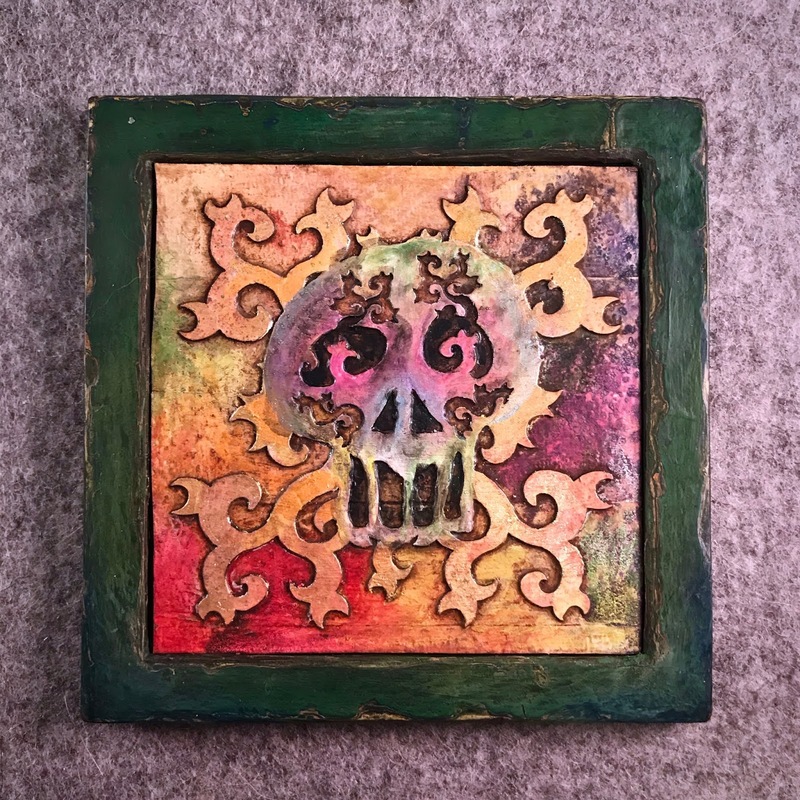 Later on, after high school art class, the polymer replacement was upgraded to a ceramic one that was almost indistinguishable from the originals. Ever since then, I was fascinated with different systems of divination. We were curious children and having a tool to answer questions was empowering and a small comfort. The Runes were a form of connection to something bigger than us and opened the door to a much larger world, where a child could solve hidden mysteries and not feel quite so alone. I decided to create a series of pendants based off the Runes. 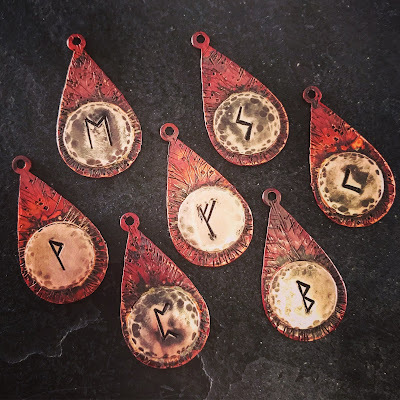 I cut out sterling silver discs and hand-stamped them with a selection of Runes. I then soldered them to a flame-polished, textured copper backplate. Once the pendants are cooled, they're cleaned, polished, and burnished by hand and coated with a protective layer of Renaissance Wax that's buffed to a nice satin sheen. 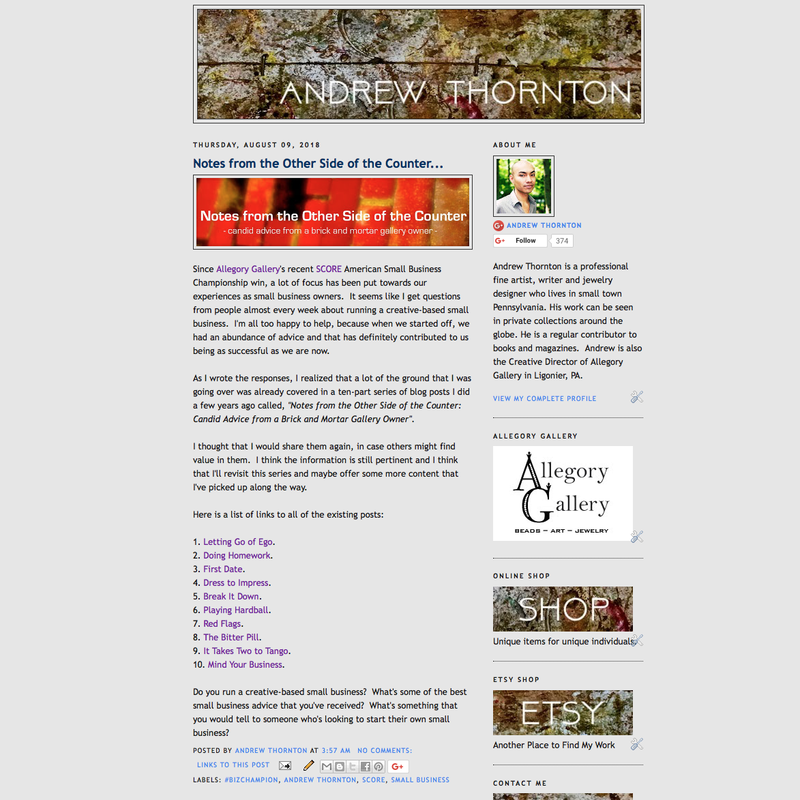 Since Allegory Gallery's recent SCORE American Small Business Championship win, a lot of focus has been put towards our experiences as small business owners. It seems like I get questions from people almost every week about running a creative-based small business. I'm all too happy to help, because when we started off, we had an abundance of advice and that has definitely contributed to us being as successful as we are now. 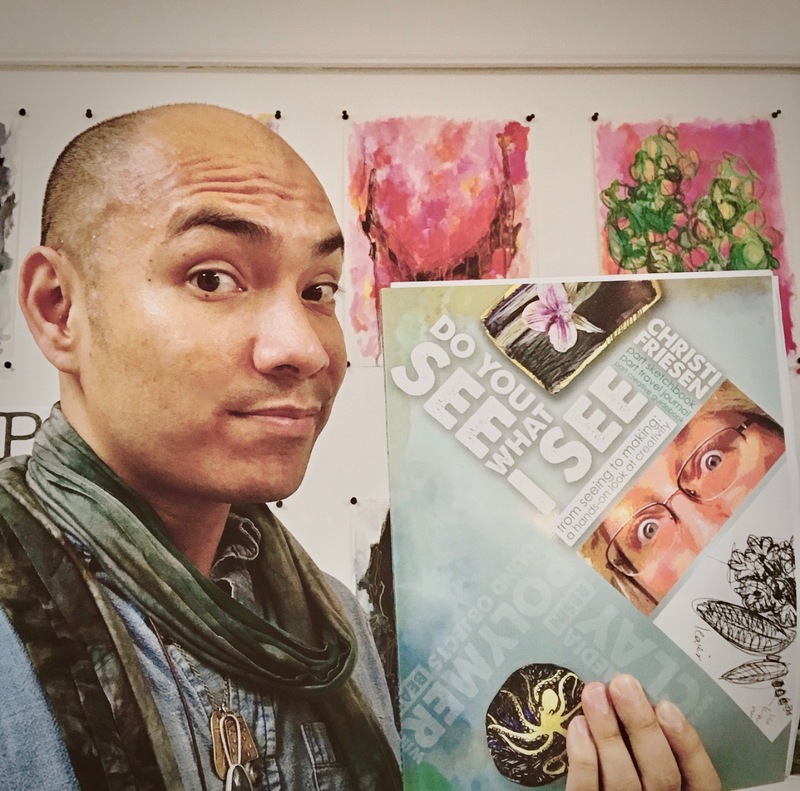 As I wrote the responses, I realized that a lot of the ground that I was going over was already covered in a ten-part series of blog posts I did a few years ago called, "Notes from the Other Side of the Counter: Candid Advice from a Brick and Mortar Gallery Owner". I thought that I would share them again, in case others might find value in them. I think the information is still pertinent and I think that I'll revisit this series and maybe offer some more content that I've picked up along the way. 1. Letting Go of Ego. 9. It Takes Two to Tango. Do you run a creative-based small business? What's some of the best small business advice that you've received? What's something that you would tell to someone who's looking to start their own small business? Even when I was little, I was fascinated by owls. The house that I grew up in had an old red barn. One of my earliest memories is of me running in the backyard, racing to the barn and flinging the doors open. Out swooped an owl, right above my head. I remember being captivated instantly and completely by this majestic creature! 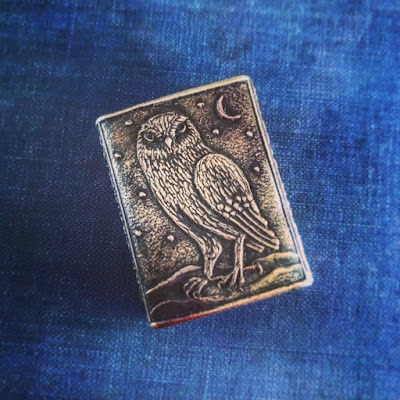 My owl collection started not long after that. One of my great aunts gave me a tiny porcelain snowy owl figurine. I used to carry it in my pocket everywhere I went. The poor thing! The feet and a wingtip broke off. The feet were lost to time, but with the help of my mother, I haphazardly glued the tip back on. My mom still has it! She keeps it in a box with other childhood treasures. 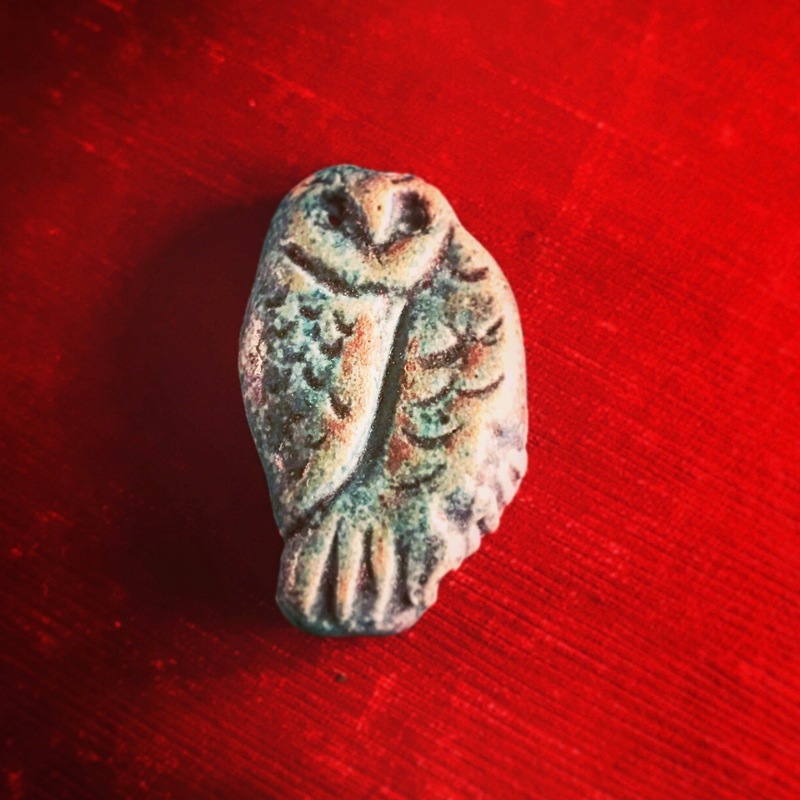 That little banged up owl figurine was just the start of my collection! I have several hundred now, each different and unique. My love of owls merged with love of art beads, resulting in several owl jewelry components! 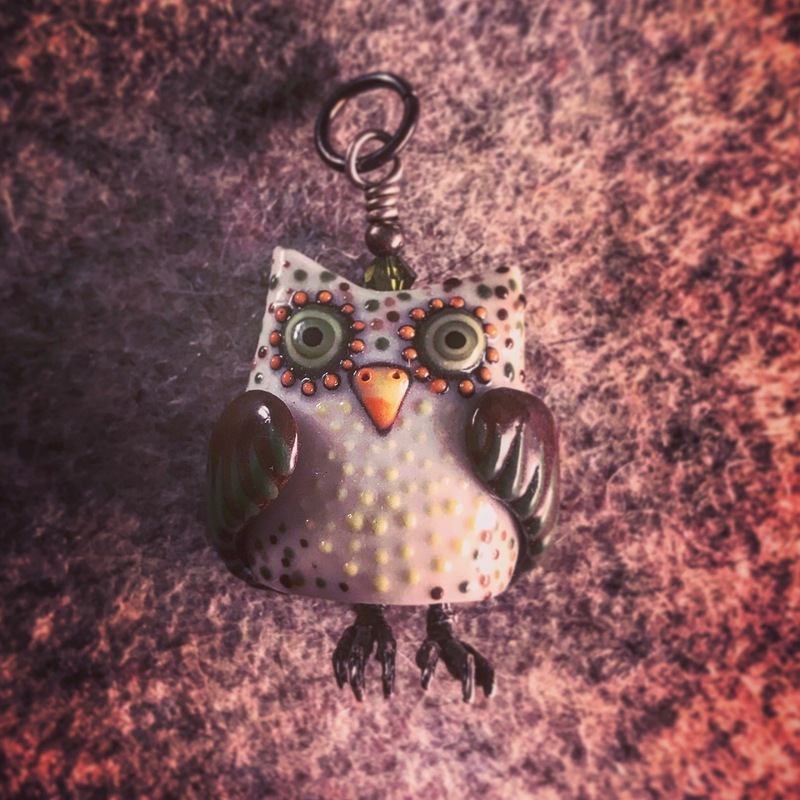 I thought about doing one epic post with all my owl art beads, but I thought that it'd be a little overwhelming. So I am going to spread out the owl love and do a few different posts featuring them. 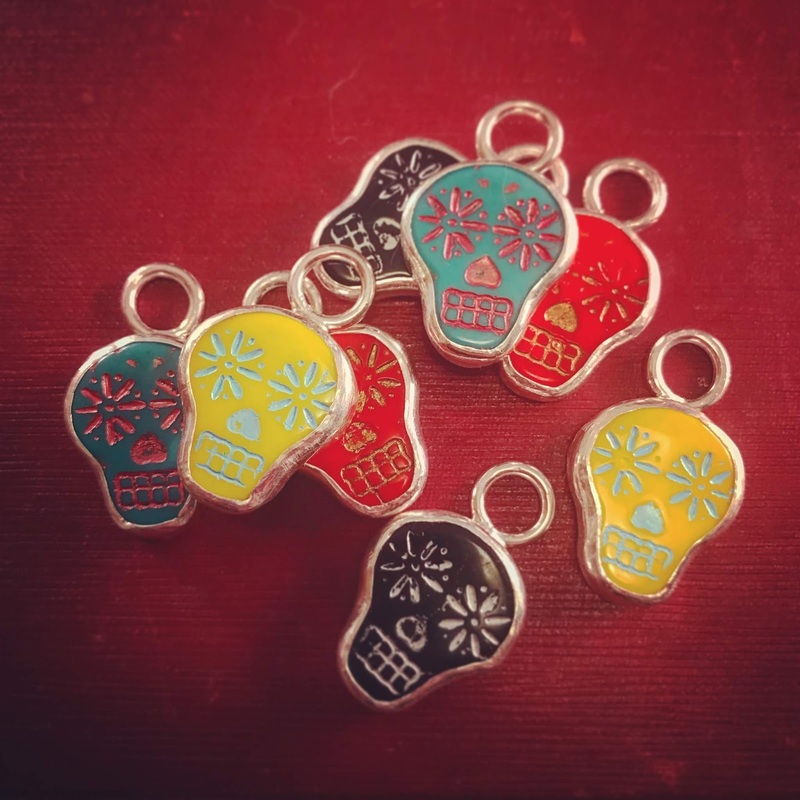 Anne Choi makes some of my favorite art beads! 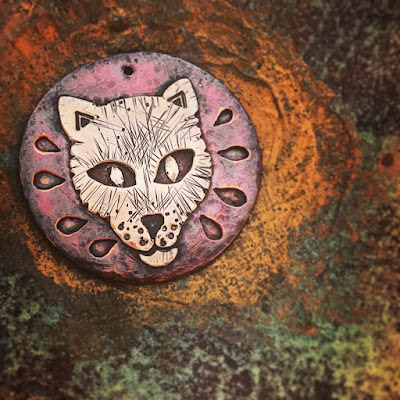 She starts off by reverse carving molds, pressing wax sheet in them, casting them (primarily in sterling silver), forming them, and then soldering them together. That's a pretty simplistic rundown of a labor-intensive exactly method for creating little works of art! Working in clay stretches back millennia. Luckily for us, the tradition continues and marches forward. One of my favorite ceramic artists is Diane Hawkey. All of her pieces convey her unique style. This piece was created by my family at Green Girl Studios in Asheville, NC. It is one of their special pieces that isn't apart of their regular line. 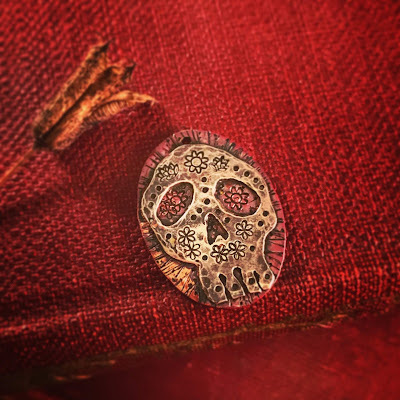 It's cast in shibuichi, a copper and silver alloy, and set with tiny rose-cut sapphire eyes. 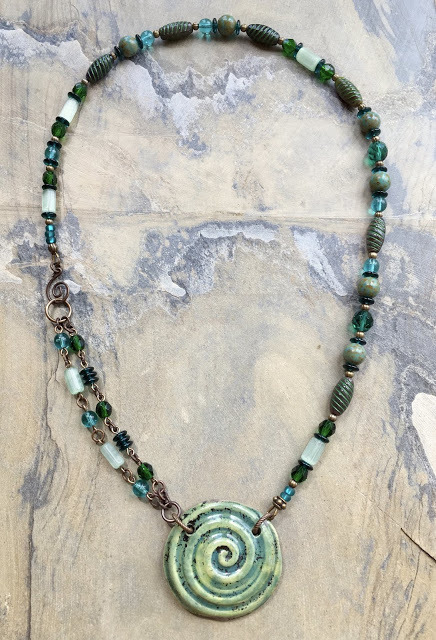 Sometimes they'll list special pieces like this in their Etsy shop or they'll make them for shows. 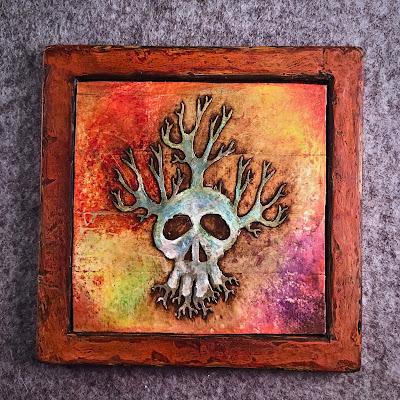 Gaea Cannaday is another fabulous artist who works primarily in ceramic clay. This particular sleeping owl head bead was embellished afterwards with Gliders' Paste. One of the coolest things to me is how different artists can use the same medium, but use different techniques to produce distinctively unique work. For instance, Joan Miller works in ceramic porcelain clay, but the way she works is a little bit different than others. She builds up layers of colored slip clay to produce her signature style. So very graphic, this ceramic pendant was made by Kylie Parry. 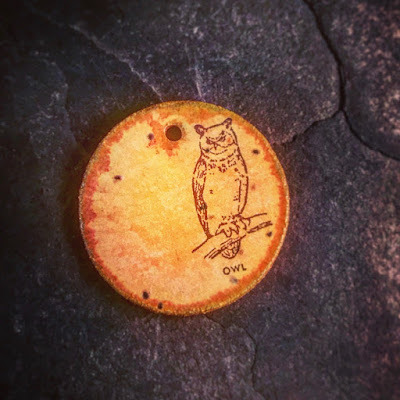 She used a decal method to transfer the illustration the owl onto her pendant. I love the nutty, red brown of the illustration. Normally when you think of making metal components, pictures of standing in front of a huge fire with spinning centrifuges may pop into your head. But this one was create differently! 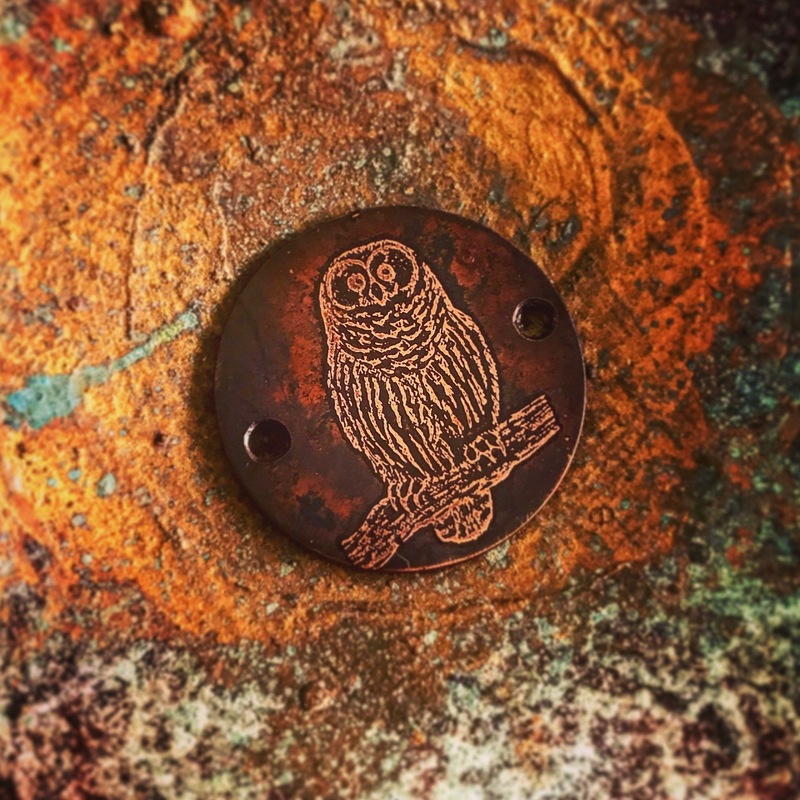 Using acid, Laurel Moon creates these striking etched copper pendants. 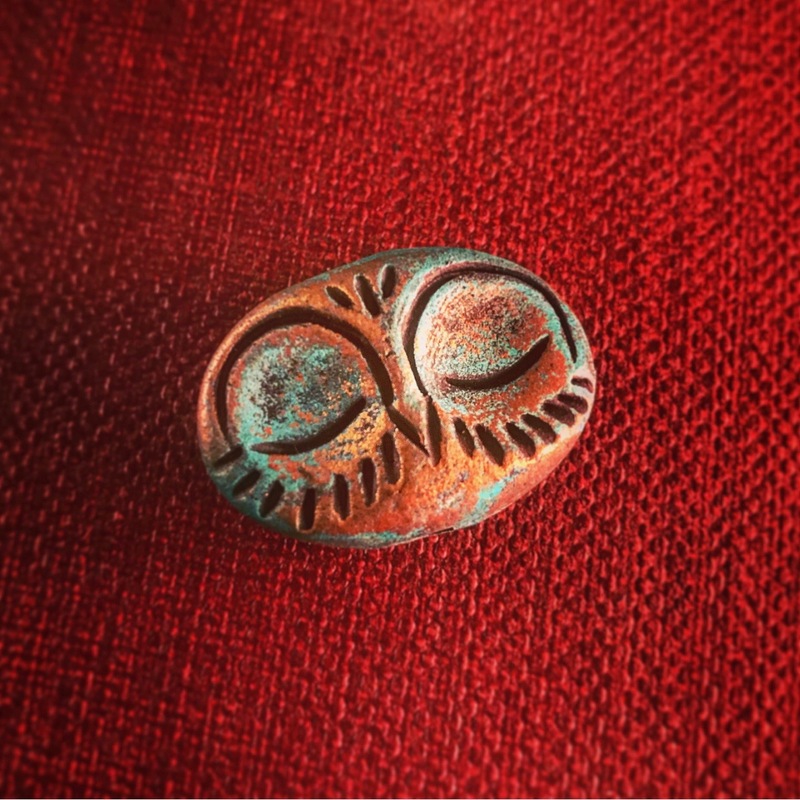 These are just a few of my owl-themed art beads. I hope you enjoyed this look into my private collection!